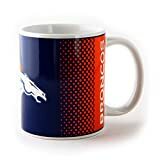 Ceramic mug with NFL Denver Broncos branding. Comes supplied in a cardboard box, making it ideal to gift to any NFL Denver Broncos fan. This is an officially licensed NFL Denver Broncos product. Ceramic mug with NFL Denver Broncos branding. Comes supplied in a cardboard box, making it ideal to gift to any NFL Denver Broncos fan. Capacity: 11oz. Not suitable for microwave or dishwasher use. This is an officially licensed NFL Denver Broncos product. This entry was posted in Sports Kits and tagged BRONCOS, Ceramic, Crest, DENVER, Fade, Football, Official by All Kits. Bookmark the permalink.